-fno-trapping-math, -ffinite-math-only, -fno-rounding-math and -fno-signaling-nans. Here we note what @pavel-kirienko had commented on: the sqrtf functions is called and therefore vsqrt.f32 is not used. One would expect a more significant performance increase. Or am I reading this wrong? Also, David, could you please note where the double precision sqrt is invoked from? It might be bugs. On Mar 20, 2017 11:07 PM, "David Sidrane" ***@***. ***> wrote: This PR will require extensive testing! @PX4TestFlights <https://github.com/PX4TestFlights> See Compiler is not emitting vsqrt.f32 on ARM Cortex M4F targets #6838 <#6838> I did some experiments with adding -ffast-math <https://gcc.gnu.org/onlinedocs/gcc-3.4.4/gcc/Optimize-Options.html> FYI:-funsafe-math-optimizations has always been in the build -ffast-math Sets -fno-math-errno, -funsafe-math-optimizations, -fno-trapping-math, -ffinite-math-only, -fno-rounding-math and -fno-signaling-nans. This option causes the preprocessor macro __FAST_MATH__ to be defined. This option should never be turned on by any -O option since it can result in incorrect output for programs which depend on an exact implementation of IEEE or ISO rules/specifications for math functions. -fno-math-errno Do not set ERRNO after calling math functions that are executed with a single instruction, e.g., sqrt. A program that relies on IEEE exceptions for math error handling may want to use this flag for speed while maintaining IEEE arithmetic compatibility. This option should never be turned on by any -O option since it can result in incorrect output for programs which depend on an exact implementation of IEEE or ISO rules/specifications for math functions. The default is -fmath-errno. -funsafe-math-optimizations Allow optimizations for floating-point arithmetic that (a) assume that arguments and results are valid and (b) may violate IEEE or ANSI standards. When used at link-time, it may include libraries or startup files that change the default FPU control word or other similar optimizations. This option should never be turned on by any -O option since it can result in incorrect output for programs which depend on an exact implementation of IEEE or ISO rules/specifications for math functions. The default is -fno-unsafe-math-optimizations. -ffinite-math-only Allow optimizations for floating-point arithmetic that assume that arguments and results are not NaNs or +-Infs. This option should never be turned on by any -O option since it can result in incorrect output for programs which depend on an exact implementation of IEEE or ISO rules/specifications. The default is -fno-finite-math-only. -fno-trapping-math Compile code assuming that floating-point operations cannot generate user-visible traps. These traps include division by zero, overflow, underflow, inexact result and invalid operation. This option implies -fno-signaling-nans. Setting this option may allow faster code if one relies on “non-stop” IEEE arithmetic, for example. This option should never be turned on by any -O option since it can result in incorrect output for programs which depend on an exact implementation of IEEE or ISO rules/specifications for math functions. The default is -ftrapping-math. -frounding-math Disable transformations and optimizations that assume default floating point rounding behavior. This is round-to-zero for all floating point to integer conversions, and round-to-nearest for all other arithmetic truncations. This option should be specified for programs that change the FP rounding mode dynamically, or that may be executed with a non-default rounding mode. This option disables constant folding of floating point expressions at compile-time (which may be affected by rounding mode) and arithmetic transformations that are unsafe in the presence of sign-dependent rounding modes. The default is -fno-rounding-math. This option is experimental and does not currently guarantee to disable all GCC optimizations that are affected by rounding mode. Future versions of GCC may provide finer control of this setting using C99's FENV_ACCESS pragma. This command line option will be used to specify the default state for FENV_ACCESS. -fsignaling-nans Compile code assuming that IEEE signaling NaNs may generate user-visible traps during floating-point operations. Setting this option disables optimizations that may change the number of exceptions visible with signaling NaNs. This option implies -ftrapping-math. This option causes the preprocessor macro __SUPPORT_SNAN__ to be defined. The default is -fno-signaling-nans. This option is experimental and does not currently guarantee to disable all GCC optimizations that affect signaling NaN behavior. Master:f2164b135d5c3327cbb2352ba86d2389016911e6 Here we note what @pavel-kirienko <https://github.com/pavel-kirienko> had commented on: the sqrtf functions is called and therefore vsqrt.f32 is not used. text data bss dec hex filename 1440572 6140 20724 1467436 16642c build_px4fmu-v3_default/src/firmware/nuttx/firmware_nuttx 09:37:33 (master $=) ~/Desktop/dev/PX4/repos/mainline/Firmware$ arm-none-eabi-objdump -d -C build_px4fmu-v3_default/src/firmware/nuttx/firmware_nuttx | grep '<sqrt' 80086ba: f0f6 fb45 bl 80fed48 <sqrtf> 800acde: f0f4 f833 bl 80fed48 <sqrtf> 800b2f4: f0f3 fd28 bl 80fed48 <sqrtf> 800b470: f0f3 fc6a bl 80fed48 <sqrtf> 800d198: f0f1 fdd6 bl 80fed48 <sqrtf> 8030a30: f0ce f98a bl 80fed48 <sqrtf> 8032d18: f0cc f816 bl 80fed48 <sqrtf> 8032dd2: f0cb ffb9 bl 80fed48 <sqrtf> 80425b0: f0bc fbca bl 80fed48 <sqrtf> 804332a: f0bb f8f9 bl 80fe520 <sqrt> 8048034: f0b6 be88 b.w 80fed48 <sqrtf> 8048108: f0b6 fe1e bl 80fed48 <sqrtf> 8048292: f0b6 fd59 bl 80fed48 <sqrtf> 8048a6c: f0b6 b96c b.w 80fed48 <sqrtf> 8048adc: f0b6 f934 bl 80fed48 <sqrtf> 8048b42: f0b6 f901 bl 80fed48 <sqrtf> 8048ba6: f0b6 f8cf bl 80fed48 <sqrtf> 8048bf4: f0b6 f8a8 bl 80fed48 <sqrtf> 804970e: f0b5 fb1b bl 80fed48 <sqrtf> 8049f48: f0b4 fefe bl 80fed48 <sqrtf> 804a6fc: f0b4 fb24 bl 80fed48 <sqrtf> 804a824: f0b4 fa90 bl 80fed48 <sqrtf> 804f35a: f0af fcf5 bl 80fed48 <sqrtf> 804f3e4: f0af fcb0 bl 80fed48 <sqrtf> 804fe04: f0ae ffa0 bl 80fed48 <sqrtf> 80526e8: f0ac bb2e b.w 80fed48 <sqrtf> 8052d4c: f0ab bffc b.w 80fed48 <sqrtf> 8052ed0: f0ab ff3a bl 80fed48 <sqrtf> 8053b08: f0ab b91e b.w 80fed48 <sqrtf> 80543b8: f0aa fcc6 bl 80fed48 <sqrtf> 805442e: f0aa fc8b bl 80fed48 <sqrtf> 8054842: f0aa fa81 bl 80fed48 <sqrtf> 805499a: f0aa f9d5 bl 80fed48 <sqrtf> 8056668: f0a7 ff5a bl 80fe520 <sqrt> 8058522: f0a6 fc11 bl 80fed48 <sqrtf> 805860a: f0a6 fb9d bl 80fed48 <sqrtf> 805871a: f0a6 fb15 bl 80fed48 <sqrtf> 806005e: f09e fe73 bl 80fed48 <sqrtf> 80600a6: f09e fe4f bl 80fed48 <sqrtf> 8061760: f09d faf2 bl 80fed48 <sqrtf> 8061998: f09d f9d6 bl 80fed48 <sqrtf> 8061a18: f09d f996 bl 80fed48 <sqrtf> 8061a30: f09d f98a bl 80fed48 <sqrtf> 8061a3c: f09d f984 bl 80fed48 <sqrtf> 8061bfc: f09d f8a4 bl 80fed48 <sqrtf> 8061ed6: f09c ff37 bl 80fed48 <sqrtf> 8061f56: f09c fef7 bl 80fed48 <sqrtf> 8061f70: f09c feea bl 80fed48 <sqrtf> 8061f7c: f09c fee4 bl 80fed48 <sqrtf> 8065428: f099 fc8e bl 80fed48 <sqrtf> 806573c: f099 fb04 bl 80fed48 <sqrtf> 806598c: f099 f9dc bl 80fed48 <sqrtf> 806fa9a: f08f f955 bl 80fed48 <sqrtf> 806fc24: f08f f890 bl 80fed48 <sqrtf> 807227c: f08c fd64 bl 80fed48 <sqrtf> 8072288: f08c fd5e bl 80fed48 <sqrtf> 8073504: f08b fc20 bl 80fed48 <sqrtf> 807c6ea: f082 fb2d bl 80fed48 <sqrtf> Processes: 22 total, 2 running, 20 sleeping CPU usage: 43.63% tasks, 1.97% sched, 54.40% idle DMA Memory: 5120 total, 1536 used 1536 peak Uptime: 249.398s total, 139.580s idle PID COMMAND CPU(ms) CPU(%) USED/STACK PRIO(BASE) STATE 0 Idle Task 139580 54.400 652/ 748 0 ( 0) READY 1 hpwork 8161 3.338 888/ 1780 192 (192) w:sig 2 lpwork 396 0.151 644/ 1780 50 ( 50) w:sig 3 init 45923 0.000 1664/ 2484 100 (100) w:sem 310 top 5492 2.959 1248/ 1684 100 (100) RUN 107 gps 733 0.075 936/ 1372 220 (220) w:sem 110 dataman 146 0.000 704/ 1180 90 ( 90) w:sem 151 sensors 10265 4.324 1344/ 1980 250 (250) w:sem 153 commander 6201 2.427 2856/ 3548 140 (140) w:sig 164 px4io 7393 3.034 968/ 1380 240 (240) w:sem 173 mavlink_if0 4455 1.669 1736/ 2436 100 (100) w:sig 175 mavlink_rcv_if0 17 0.000 952/ 2100 175 (175) w:sem 186 mavlink_if1 3108 1.289 1632/ 2388 100 (100) w:sig 187 mavlink_rcv_if1 16 0.000 952/ 2100 175 (175) w:sem 307 commander_low_prio 8 0.000 592/ 2996 50 ( 50) w:sem 223 mavlink_if2 10603 4.248 1632/ 2388 100 (100) w:sig 229 mavlink_rcv_if2 18 0.000 952/ 2100 175 (175) w:sem 234 sdlog2 123 0.000 1696/ 3316 177 (177) w:sig 277 ekf2 29594 12.518 5072/ 5780 250 (250) w:sem 284 mc_att_control 10766 4.704 1280/ 1676 250 (250) w:sem 286 mc_pos_control 6464 2.883 616/ 1876 250 (250) w:sem 296 navigator 26 0.000 952/ 1572 105 (105) w:sem total used free largest Mem: 235024 189072 45952 42912 Master: with -ffast-math #6863 <#6863> Here we note that there are only 2 calls to the sqrt function. The reset have been replaced with vsqrt.f32 with -ffast-math text data bss dec hex filename 1435836 6140 20724 1462700 1651ac build_px4fmu-v3_default/src/firmware/nuttx/firmware_nuttx 09:33:05 (master_hw_fpu $) ~/Desktop/dev/PX4/repos/mainline/Firmware$ arm-none-eabi-objdump -d -C build_px4fmu-v3_default/src/firmware/nuttx/firmware_nuttx | grep '<sqrt>' 8043202: f0ba fa19 bl 80fd638 <sqrt> 805601c: f0a7 fb0c bl 80fd638 <sqrt> Processes: 22 total, 2 running, 20 sleeping CPU usage: 42.24% tasks, 1.90% sched, 55.86% idle DMA Memory: 5120 total, 1536 used 1536 peak Uptime: 249.073s total, 147.554s idle PID COMMAND CPU(ms) CPU(%) USED/STACK PRIO(BASE) STATE 0 Idle Task 147553 55.859 652/ 748 0 ( 0) READY 1 hpwork 8484 3.500 960/ 1780 192 (192) w:sem 2 lpwork 403 0.152 644/ 1780 50 ( 50) w:sig 3 init 37662 0.000 1660/ 2484 100 (100) w:sem 303 top 1099 2.968 1248/ 1684 100 (100) RUN 100 gps 781 0.532 936/ 1372 220 (220) w:sem 103 dataman 145 0.000 704/ 1180 90 ( 90) w:sem 144 sensors 8668 3.424 1328/ 1980 250 (250) w:sem 146 commander 6500 2.968 2848/ 3548 140 (140) w:sig 153 px4io 7102 2.891 1056/ 1380 240 (240) w:sem 166 mavlink_if0 4582 1.826 1736/ 2436 100 (100) w:sig 168 mavlink_rcv_if0 16 0.000 952/ 2100 175 (175) w:sem 179 mavlink_if1 3190 1.217 1632/ 2388 100 (100) w:sig 180 mavlink_rcv_if1 16 0.000 952/ 2100 175 (175) w:sem 300 commander_low_prio 8 0.000 592/ 2996 50 ( 50) w:sem 216 mavlink_if2 11284 4.642 1632/ 2388 100 (100) w:sig 218 mavlink_rcv_if2 17 0.000 952/ 2100 175 (175) w:sem 223 sdlog2 123 0.000 1696/ 3316 177 (177) w:sig 270 ekf2 27796 11.339 5064/ 5780 250 (250) w:sem 277 mc_att_control 10659 4.261 1280/ 1676 250 (250) w:sem 279 mc_pos_control 6208 2.511 664/ 1876 250 (250) w:sem 285 navigator 28 0.000 952/ 1572 105 (105) w:sem nsh> free total used free largest Mem: 235024 187904 47120 44256 nsh> The replacements with -ffast-math 8008654: eeb1 7ae7 vsqrt.f32 s14, s15 800ac76: eef1 7ac7 vsqrt.f32 s15, s14 800b284: eeb1 7ae7 vsqrt.f32 s14, s15 800b3f8: eeb1 7ae7 vsqrt.f32 s14, s15 800d114: eeb1 7ae7 vsqrt.f32 s14, s15 8030960: eef1 0ae0 vsqrt.f32 s1, s1 8032be8: eef1 7ac7 vsqrt.f32 s15, s14 8032c9e: eef1 7ac7 vsqrt.f32 s15, s14 8042488: eeb1 7ae7 vsqrt.f32 s14, s15 8043202: f0ba fa19 bl 80fd638 <sqrt> 8047e90: eeb1 0ac0 vsqrt.f32 s0, s0 8047f62: eef1 6ac6 vsqrt.f32 s13, s12 80480e6: eeb1 8ac0 vsqrt.f32 s16, s0 80488b8: eeb1 0ac0 vsqrt.f32 s0, s0 8048924: eef1 7ae6 vsqrt.f32 s15, s13 804898a: eeb1 7ae7 vsqrt.f32 s14, s15 80489ee: eef1 7ae6 vsqrt.f32 s15, s13 8048a3c: eeb1 7ae7 vsqrt.f32 s14, s15 8049556: eef1 6ac6 vsqrt.f32 s13, s12 8049d86: eeb1 aae7 vsqrt.f32 s20, s15 804a4f8: eef1 6ae7 vsqrt.f32 s13, s15 804f120: eeb1 7ae7 vsqrt.f32 s14, s15 804f1a8: eef1 7ac7 vsqrt.f32 s15, s14 80523f0: eeb1 0ac0 vsqrt.f32 s0, s0 8052a1c: eeb1 0ac0 vsqrt.f32 s0, s0 8052ba4: eeb1 8ae7 vsqrt.f32 s16, s15 80537d8: eeb1 0ac0 vsqrt.f32 s0, s0 8054014: eef1 7ac0 vsqrt.f32 s15, s0 80540be: eeb1 7ae7 vsqrt.f32 s14, s15 80545ae: eeb1 7ae7 vsqrt.f32 s14, s15 80545f0: eeb1 7ae7 vsqrt.f32 s14, s15 805601c: f0a7 fb0c bl 80fd638 <sqrt> 8057ed2: eeb1 7ae7 vsqrt.f32 s14, s15 8057fba: eeb1 7ae7 vsqrt.f32 s14, s15 80580ca: eeb1 7ae7 vsqrt.f32 s14, s15 805f98c: eeb1 7ae7 vsqrt.f32 s14, s15 805f9be: eeb1 7ae7 vsqrt.f32 s14, s15 806109c: eeb1 5ae4 vsqrt.f32 s10, s9 80612b8: eeb1 6ac7 vsqrt.f32 s12, s14 80612f0: eeb1 7ae7 vsqrt.f32 s14, s15 80612fe: eeb1 7ac5 vsqrt.f32 s14, s10 8061306: eeb1 7ae5 vsqrt.f32 s14, s11 80614d4: eef1 5ac4 vsqrt.f32 s11, s8 8061782: eeb1 eae7 vsqrt.f32 s28, s15 80617c8: eeb1 7ae7 vsqrt.f32 s14, s15 80617d6: eeb1 7ac9 vsqrt.f32 s14, s18 80617de: eeb1 7ae6 vsqrt.f32 s14, s13 8064c74: eef1 6ae7 vsqrt.f32 s13, s15 8064fa8: eeb1 6ac7 vsqrt.f32 s12, s14 80651f0: eef1 7ac7 vsqrt.f32 s15, s14 806f312: eeb1 7ae7 vsqrt.f32 s14, s15 806f4a0: eeb1 7ae7 vsqrt.f32 s14, s15 8071adc: eeb1 7ae7 vsqrt.f32 s14, s15 8071b0e: eef1 7ac7 vsqrt.f32 s15, s14 8072d8e: eeb1 7ae7 vsqrt.f32 s14, s15 807bf7c: eef1 8ae7 vsqrt.f32 s17, s15 — You are receiving this because you were mentioned. Reply to this email directly, view it on GitHub <#6863 (comment)>, or mute the thread <https://github.com/notifications/unsubscribe-auth/ADJUZAnhIcJtQxraxxkhLJeKBxckGER0ks5rntyTgaJpZM4Mi7dx> . This looks like a dead end. @pavel-kirienko do see any merit in pursuing this? This seems to be invoked from the library, whose code is probably not affected by the optimization flags. Concerning whether we should pursue this further I will reply in the original issue thread. We had -ffast-math enabled earlier and it probably got rather accidentally dropped. That history puts me a bit at ease. There is one notable change that I think came about in the cmake transition. 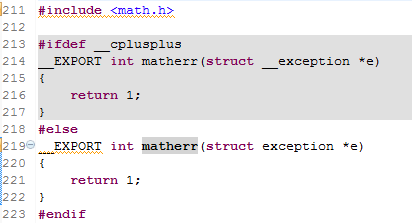 Pre cmake, we carried version of matherr that always returned 1 in the fmu_init.c file. @jgoppert can you shed some light on this? Gives us a smaller build saving 4736 bytes. (master:1440572 master_hw_fpu:1435836) and better math performance. So this PR, once vetted will help on 2 fronts. I have concerns regarding fast-math's implicit enabling of finite-math-only. We need to be certain we don't use NaNs anywhere in firmware to detect numeric instability or uninitialized values. Went to try this in the field with a DJI F450. Closing as stale, but keeping the branch. There's actually a lot more to discuss here before we do anything.